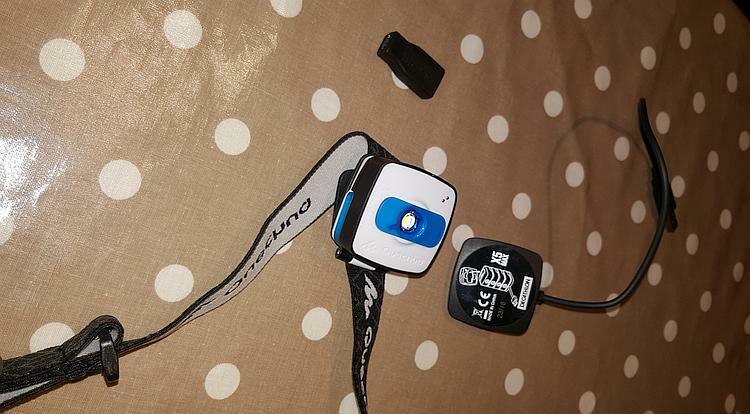 When preparing for my Lake District camp with Ren I gathered items from his comprehensive camping list and picked up a head torch from decathlon. £12.99 I paid for it but it is listed at £14.99. Ren seemed interested in it as its rechargeable via a USB lead. This can be a micro USB(Adapter included) or standard USB port. He has a suitable charger under his bike seat, so if it runs out of charge whilst on holiday it can be topped up straight away. It's bright and simple to use. The light comes with a removable back plate so it can be fitted to either the headband or clipped to the side of a tent pole. You can buy the units without the charger which are cheaper and up to 5 can be charged by the one charger at the same time by clicking them together. These can then be placed around the tent to light it up. A charge seems to last quite a long time, up to 20 hours on the lower setting. It has a red setting to preserve night vision which lasts 40hours. Might be just the thing for a camping trip. Worked fine for me when I could find it in the tent - lesson learnt - take it with you when leaving the tent and coming back in the dark. The main thing that appeals to me with this torch is the fact that it's USB rechargeable. Currently I use a regular torch with regular rechargeable batteries. I don't have nor can I find a battery charger for AA batteries that will attach to my motorcycle for charging. Well you've done far better than I did Borsuk.